...This is the first Emeril Lagasse recipe I have ever made. ...This is also the first spice cake I have ever made...not sure why I haven't had this cake in my life sooner. ...That almond cake I made earlier this month, was also the first almond cake I had ever made. ...Last night I made my first crostata and it looks a little something like this...it's apple and cranberry and totally what I wanted to make when it was cold and snowy outside. Hmmm what else should I make this month? One month, 6 office birthdays which will ultimately equal 6 different desserts. Oh and somehow it passed me by, but it's been FOUR years now here whisking away...holy cow! This will mark my 278th post; there have been about 252 recipes to go through this blog and my kitchen, plus I have been able to have several friends stop by and share their recipes with you. You have gotten to travel with me to a few bakeries to hear how their owners started and travel with my as I stuff my face. It has been a lot of fun the entire way! So thank you for reading and being a part of my baking adventures. Please, please feel free to comment anytime. I LOVE hearing from you out there! It was New Year's Eve and I didn't make something sweet. To end 2014 I went savory and could not have been happier that I did. These pancetta mushroom onion tarts are seriously delicious and I am not just trying to talk them up. I am really just already trying to find another excuse to make them. They are the quintessential French tart and super easy to make. I was aiming for these tarts to taste like my favorite tart at Le Diplomate in DC, and I think I hit fairly close to the mark. If mushrooms aren't your arch nemesis like they are a friend of mines, then your should definitely give these a try! Plus you could definitely make these single serving size instead of making them finger food "party sized". Either way Enjoy! Well it's 2015...Let's see how many times I write 2014 before I get it right. All signs are currently pointing for 2015 to be a year of growth. To try something new and not wait around for life to happen. Just last week my horoscope (and let me add I do not check more horoscope weekly, nor do I really believe there is anything behind them, but they are occasionally on point) pointed me in the direction of a quote by author Robert Moss, "If we wait until we are fully prepared in order to do something, we may never get it done," he says. "It's important to do things before we think we are ready." I am going to try and think about this going into 2015 and really try to dive in this year. To not be afraid of what could happen by take what does happen in strides. The question then is, what are you going to dive into in 2015? This year there were 26 office birthday desserts; here are a handful. There were challenges...making a giant Reese's cup; there were classics...carrot cake; and there were boozy cakes...an Old Fashioned Cake with bourbon and all. This year I got to bake for friends...pies and cakes, including a pig grooms cake and bumble bee cupcakes for a baby shower; plus 103 cupcakes and one salted caramel cake for a wedding. This year I have learned what it is to be completely exhausted from baking. I did it again just last week. 8 cakes with 7 frosting and two fillings in two days. 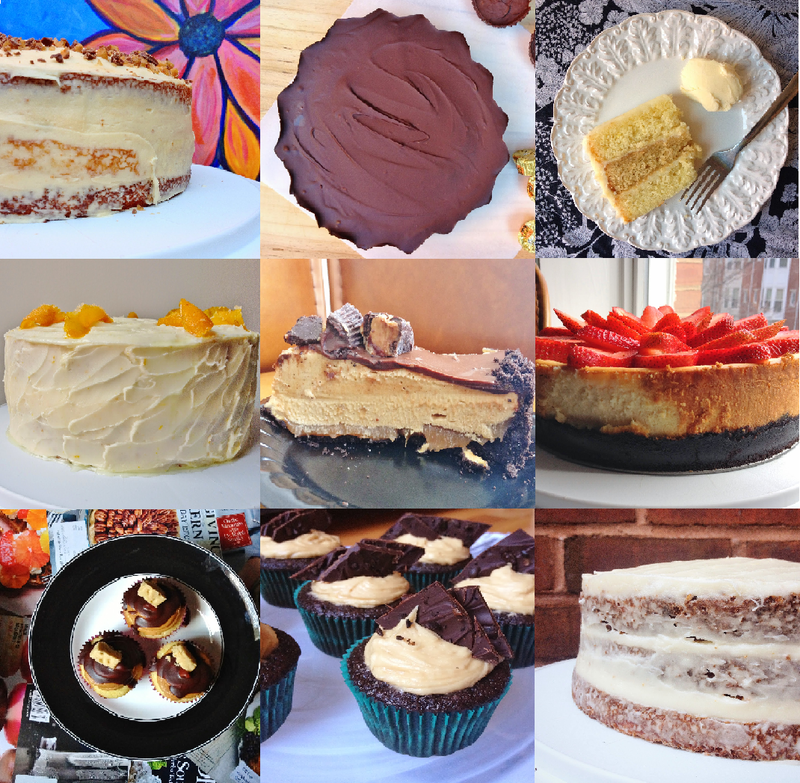 I might have had to sit down in a chair to prepare brunch for the next day after baking all of these cakes.